DETROIT, Mich. — After the case was remanded by the Michigan Supreme Court, the Michigan Court of Appeals has ruled that a Midland-area woman has a valid Consumer Protection Act claim against Planet Fitness in that representatives failed to inform her before she signed up for membership that the company has an “unwritten policy” allowing men who identify as women to use the women’s locker room. If she had known about the policy beforehand, she might not have become a member, the court reasoned. “Although the use of the gym for exercise and fitness activities appears to have been the central aspect of the transaction, defendants’ provision of locker rooms and restrooms is also part of the transaction given that gym members obviously may wish to change clothes or shower in a locker room in connection with their fitness activities, and restrooms are also needed,” the three-judge panel wrote. “Therefore, although defendants’ policy regarding the locker rooms and restrooms was not the sole or major reason for the transaction, a policy regarding such facilities could still be viewed as important to the transaction,” it stated. The court concluded that “a reasonable inference arises from [the woman’s] allegations that defendants’ failure to inform her of the unwritten self-identification policy concerning locker rooms and restrooms affected her decision to join the gym,” noting that she was only informed of the policy after she was already a member, and at that point, she couldn’t cancel without a financial penalty. While the panel rejected other claims in the legal challenge, it found this aspect of the case as being a sufficient claim under the Michigan Consumer Protection Act. Read the Michigan Appeals Court ruling in full here. As previously reported, Yvette Cormier, now 51, sued Planet Fitness in 2015 after she walked into the Midland women’s’ locker room and was surprised to see a man wearing makeup and a wig. Cormier then went to the front desk to express concern. She was told that others had complained, but that the facility allows patrons to use the locker room with which they identify. She went back to Planet Fitness a few days later, at which time she began to warn other female club members that a man had been present in the women’s locker room. The next day, the corporate office of Planet Fitness called Cormier and informed her that she had violated their “no judgment” policy and that it had decided to revoke her membership. After the matter went public, Planet Fitness spokesperson McCall Gosselin outlined in a press release that Cormier’s membership wasn’t canceled simply because she complained, but rather because of the way that she handled the matter. “The manner in which this member expressed her concerns about the policy exhibited behavior that management at the Midland club deemed inappropriate and disruptive to other members, which is a violation of the membership agreement and as a result her membership was canceled,” she said in a statement. The man who Cormier had discovered in the locker room later came forward, advising that he isn’t a member, and that he had used the area on a few occasions to hang his coat and purse while he visited with a friend. Weeks later, Cormier filed suit, citing invasion of privacy, wrongful retaliation, Consumer Protection Act violations and breach of contract. “Plaintiff may have reasonably expected only women would be present in the women’s locker room, even in the common area; however, she could no longer reasonable expect only women would use the facility after being told about the ‘judgment-free zone’ policy of Planet Fitness,” wrote Judge Michael Beale. Cormier appealed, stating that Planet Fitness’ “judgment free” slogan does not clearly indicate to women that they might have to share their facilities with men who identify as women. 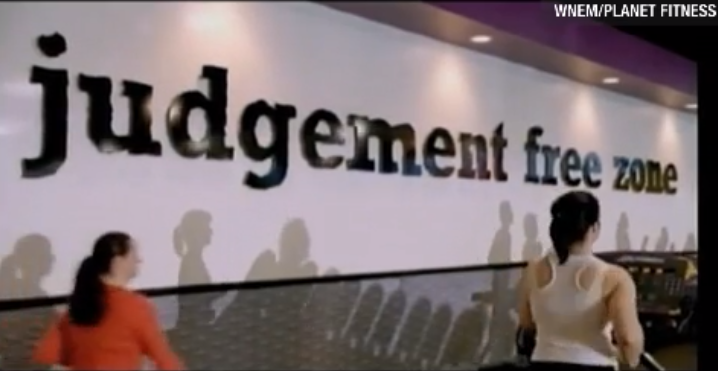 “This begs the question, what exactly does Planet Fitness’ ‘judgment-free zone’ mean?” it asked. However, the Michigan Court of Appeals unanimously upheld Beale’s conclusion, finding that the woman did not experience any actual harm because the man never saw her undressed and didn’t make any sexual advances toward her. In pondering the case earlier this year, the Michigan Supreme Court sent the matter back to the appeals court to reconsider its ruling in light of Cormier’s Consumer Protection Act claims, stating that the panel erred in not considering those specific arguments. On Thursday, the appeals court issued a new ruling in light of the remand, finding that Cormier did have standing to sue for one of the aspects of the case. It similarly remanded the matter back to Beale for further proceedings. If Cormier indeed wins her case, Kallman will ask that Planet Fitness clearly state its policy in its contracts and place notices inside of the gym.